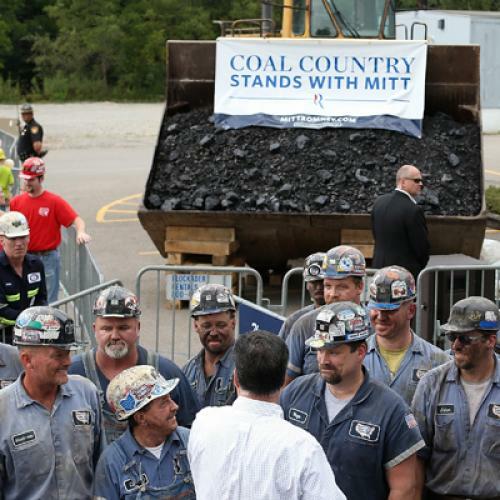 What Was Romney Doing In Coal Country? Last month, I reported on the very impressive political fundraising operation at Murray Energy, a privately-held, 3,000-worker coal company based in Ohio, where white collar employees have for years felt pressure to give to the company political action committee and to Republican candidates favored by CEO Robert Murray. This year, Murray hosted a $1.7 million fundraiser for Mitt Romney in May and a Romney rally at one of the company's Ohio mines in August. The rally served as the backdrop for a Romney TV ad. Dear Lord: The American people have made their choice. They have decided that America must change its course, away from the principals of our Founders. And, away from the idea of individual freedom and individual responsibility. Away from capitalism, economic responsibility, and personal acceptance. We are a Country in favor of redistribution, national weakness and reduced standard of living and lower and lower levels of personal freedom. My regret, Lord, is that our young people, including those in my own family, never will know what America was like or might have been. They will pay the price in their reduced standard of living and, most especially, reduced freedom. The takers outvoted the producers. In response to this, I have turned to my Bible and in II Peter, Chapter 1, verses 4-9 it says, ‘To faith we are to add goodness; to goodness, knowledge; to knowledge, self control; to self control, perseverance; to perseverance, godliness; to godliness, kindness; to brotherly kindness, love.’ Lord, please forgive me and anyone with me in Murray Energy Corp. for the decisions that we are now forced to make to preserve the very existence of any of the enterprises that you have helped us build. We ask for your guidance in this drastic time with the drastic decisions that will be made to have any hope of our survival as an American business enterprise. Amen. Others have already called into question the notion of a direct link between Obama's reelection and the industry struggles that are forcing the company to downsize. Most notable is the fact that the industry is threatened above all by the boom in cheap natural gas as a rival energy source, as well as by the rising cost of coal production as supplies dwindle, and by lessened demand for coal exports as a result of China's economic slowdown. Then there is the fact that the Obama administration has not clamped down on coal and other emissions-producing sectors nearly as hard as many environmentalists would have liked, and continues to tout the potential for "clean coal" technologies in which carbon dioxide gases would be stored underground. However, Murray's eye-catching prayer raises another question that I did not explore fully in my piece last month: What, exactly, was Mitt Romney thinking in making such an aggressive play for coal country, and allying himself with Bob Murray as part of that? The answer may seem obvious: three of the swing states Romney dearly wanted to win are coal-producing–Ohio, Virginia and Colorado–as is Pennsylvania, the state Republicans have been trying to get back in their column for two decades. Coal country tends to be dominated by just the sort of working-class white voters who have been cool to Obama from the get-go. And, whatever the reality of Obama's impact on the coal industry, there is a strong sense among its executives that he has indeed been engaged in a four-year "war on coal." (Never mind that as a senator in coal-producing Illinois he was for a time awfully cozy with the industry.) To the Romney campaign, this must've made for a seeming no-brainer: Want to win those three or four states? Go hard on coal. But was this the right calculation? It seems that this may have been another instance where the Romney campaign made the mistake of elevating anecdote and instinct over hard numbers. And the press may have been in complicit in this. We talk a lot about "coal country" as if it's a major swath of the country and a trove of swing-state votes, but it really isn't. According to the National Mining Association, there are only 2,800 mining jobs in Ohio, 5,000 in Virginia, 2,200 in Colorado and 8,300 in Pennsylvania. The largest coal-producing states are solidly Republican: West Virginia (21,000 jobs) and Kentucky (17,000 jobs). And it's not just the industry that doesn't have a whole lot of swing-state numbers–it's coal country as a whole. Simply put, coal country is very sparsely populated territory. The Murray operations in Ohio are concentrated in Belmont and Monroe counties in the Ohio River Valley in the southeastern part of the state. In 2008, slightly more than 32,000 people voted in Belmont County and fewer than 7,000 voted in Monroe (the second-lowest vote tally in the state). Romney improved on John McCain's numbers in this part of the state, but to little effect -- in Belmont, he picked up a swing of about 3,500 votes, and in Monroe, fewer than 1,200. Contrast that with the scale of the auto industry in the state: Roughly one in eight Ohio jobs are linked to auto makers and parts suppliers, and there's a plant or supplier in all but a few of the state's counties. Lucas County, which includes Toledo and one of the Jeep plants that Romney wrongly said was headed to China, netted Obama more than 61,000 votes, more than 10,000 above his 2008 margin in Lucas. My colleague Nate Cohn makes a convincing case that Obama's strength in places like Lucas had more to do with strong black turnout than the auto bailout. But there's no question that the auto industry is more present in the minds of most Ohioans than a coal industry that's tucked along the state's rural southeastern edge. Similarly, Virginia's coal country is concentrated in the Old Dominion's far southwestern tail, which is closer to Nashville than to vote-rich Northern Virginia. Yet Romney and Paul Ryan made several visits there and ran pro-coal ads in the state, to the mystification of Virginia Republicans like former congressman Tom Davis of Northern Virginia, who told Slate's Dave Weigel, "Northern Virginia is 28 percent of the statewide vote. Coal country is 9 percent. And the problem is that it's not a growing vote. The NoVa vote is a growing vote. The Hispanic vote is growing. The Asian vote is growing...We should be buying ads in Asian newspapers. They're cheaper and they have an impact. A lot of this ad money is wasted." But Romney's heavy emphasis on coal arguably undermined his campaign in ways that went beyond a misallocation of campaign resources. Making such a strong play for an industry in decline with such a well-publicized record of problems–from terrible accidents to environmental disasters–surely heightened his image as the candidate of a bygone America, in contrast to his hyper-modern opponent. Romney so easily could have avoided this, at least when it came to the energy issue. After all, as governor of Massachusetts, he had condemned a coal-fired power plant as a place that "kills people," pushed for major action to limit carbon emissions, and even promoted anti-car smart-growth policies. Even without going as far as Obama in pushing green energy and thereby completely cutting off political contributions from the fossil fuel industry that is so opposed to the president, Romney could have presented himself as a relatively forward-looking fellow on this front. But instead, there he was in Ohio appearing at a mine whose company would shortly thereafter be hit with a $1 million fine stemming from the 2007 accident at its Crandall Canyon mine in Utah, where nine people died, and whose owner was known for making heated, often-impolitic declarations, such as after the Crandall Canyon disaster, which Robert Murray blamed on an earthquake, against the conclusion of scientists. The disjunction between the cosmopolitan candidate Romney might've been and the one he chose to be was on display after his speech at the mine, when I observed several Romney staffers in chinos and nice dress shirts wrapping things up with the mine director in his office. One of the Romney staffers pointed at some lumps of coal in the office and asked, "Is that coal?" Yes, the mine director told him. Bemused, he told the Romney staffer he was welcome to take a lump of the coal with him back to Boston, as if it were exotic material from the moon. For the Romney campaign, of course, it may as well have been, which is why they may have been better off steering clear of coal country in the first place.